By the river and the Sea. 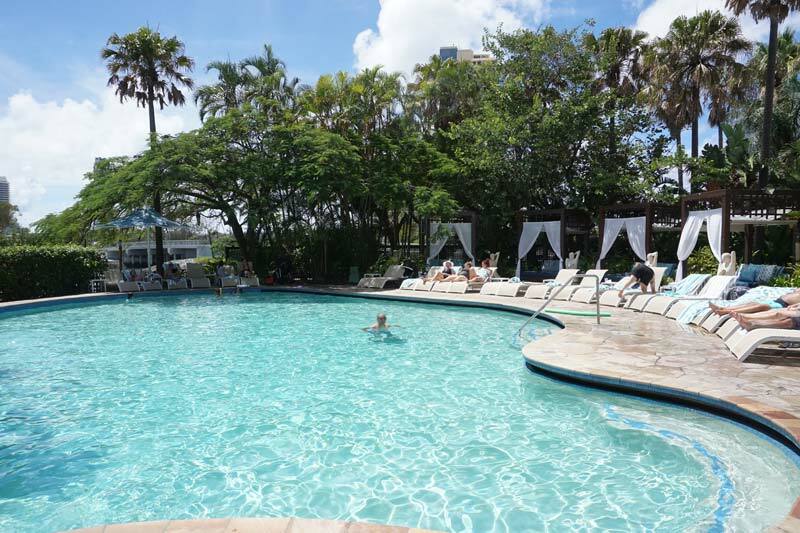 Image: Surfers Paradise Marriott Resort & Spa. On the Gold Coast where shiny new glass and metal skyscrapers squeeze every square foot, the Surfers Paradise Marriott Resort and Spa, which opened in 1992 and underwent a $20 million refurbishment in 2012, offers families generous amounts of space in a elegant yet relaxed setting. A grand dame on the glitter strip they just don’t build resorts like these anymore, the lush tropical grounds surrounds a huge saltwater sandy lagoon with tumbling waterfalls and bashful tropical fish. 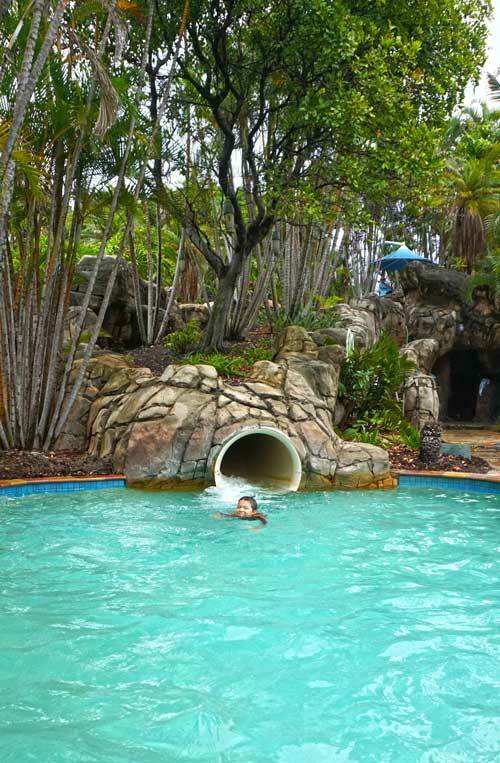 You’ll find the kids making good use of the aquatic playground, seen floating along the lazy river, zipping down an enclosed water slide, plunging into the heated spa grotto and splashing in the cavern. 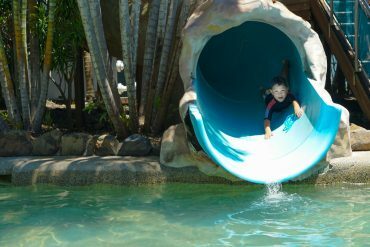 Pros: Drop and flop at Surfers Paradise Marriott Resort and Spa, with so much aquatic fun, kids will not want to leave. Cons: With coral hues and early 90’s style architecture, the resort may not aesthetically scream five star even though the prices do. 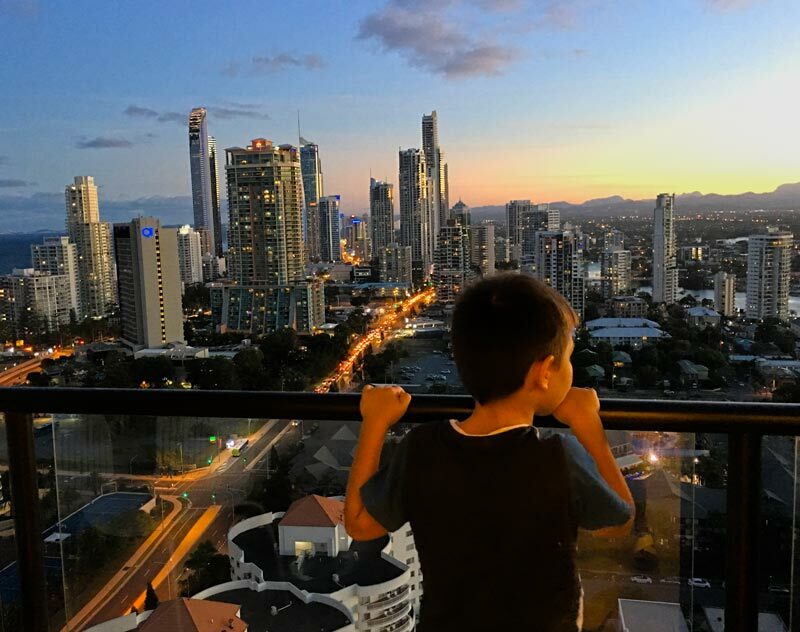 Families should stay at Surfers Paradise Marriot Resort and Spa for the family friendly five star facilities, spacious refurbished rooms, kid friendly dining and one of the best kids club’s on the Gold Coast. 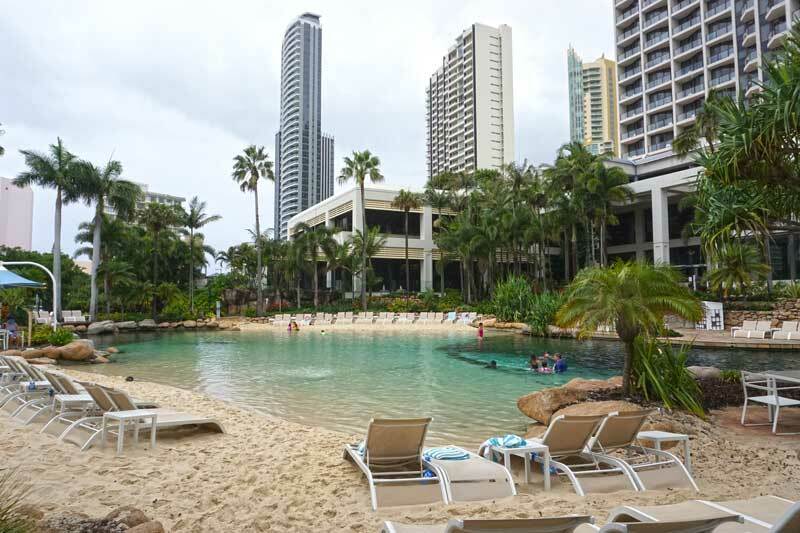 Book Surfers Paradise Marriott Resort and Spa here. 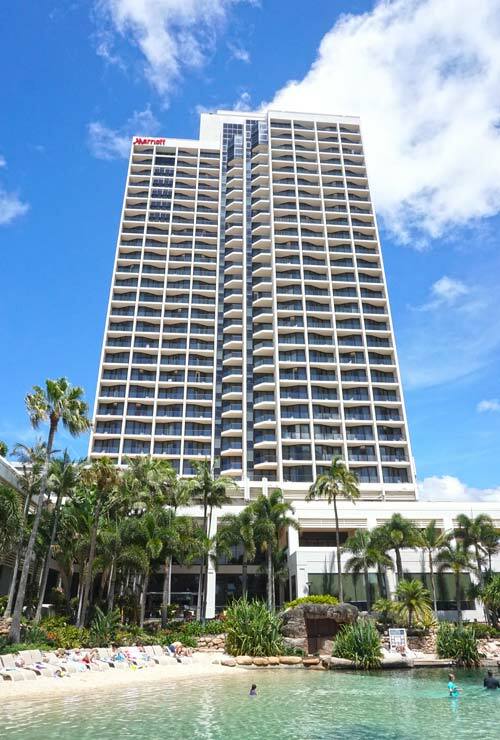 Almost a quarter century old, Surfers Paradise Marriott Resort & Spa is still looking good. 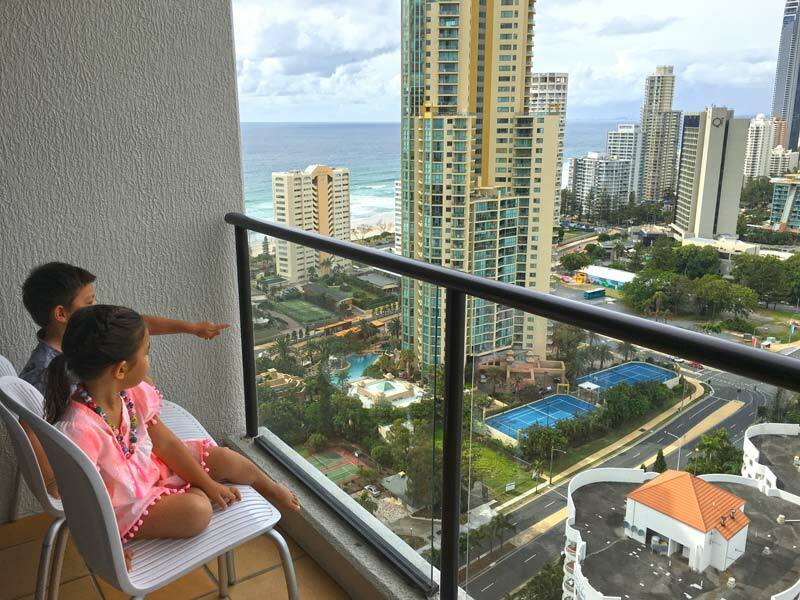 The Surfers Paradise Marriott Resort and Spa has 329 rooms and suites over 28 floors, each with balcony views. 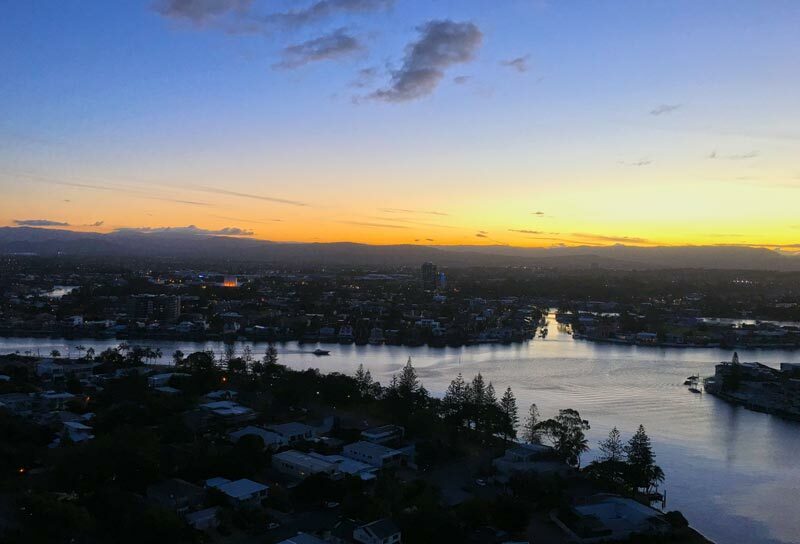 Stepping out on the balcony afforded unobstructed views of the Gold Coast city skyline, on our left were glimpses of Surfers Paradise Main Beach and on the right the Gold Coast canals and hinterland. Spacious 42 square meter rooms, elegantly styled in blonde woods, ocean accents and colours of cream and coral are complimented with mirrors throughout, opening up the rooms further. Our room on the 23rd floor, comfortably slept our family of four in two Queen beds each with a fluffy pillowtop. For families with infants, cots and high chairs are available on request. Rooms have a maximum occupancy of four people with one rollaway bed permitted. The bright white tiled bathroom with coral coloured marble trim offered a spacious vanity, loads of storage in drawers, shelves and cupboards, roomy shower with built in ledge and separate full size bathtub. Even the wardrobe was larger than normal with a walk in closet area providing ample storage space for the whole family. Baggage, baby gear and beach toys were hidden from view easily by sliding close the plantation doors. 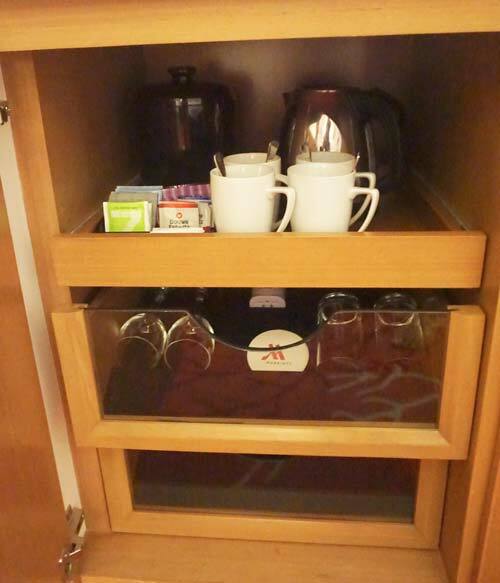 More storage could be found on the bedside tables and large sideboard also used to store basic tea and coffee making facilities, wine glasses and a handy bottle opener. 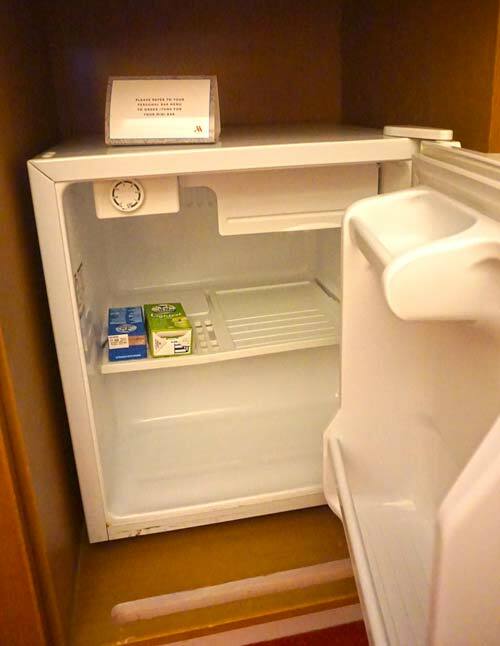 A small refrigerator ideal for storing water bottles, baby food and milk is provided as well as all standard amenities including: hotel shampoo, conditioner, soap and bodywash, two adult bathrobes, slippers, iron and board and a good hairdryer. Reverse cycle air-conditioned guest rooms are equipped with speedy free WIFI able to host multiple devices, as well as cabled connection by the writing desk. 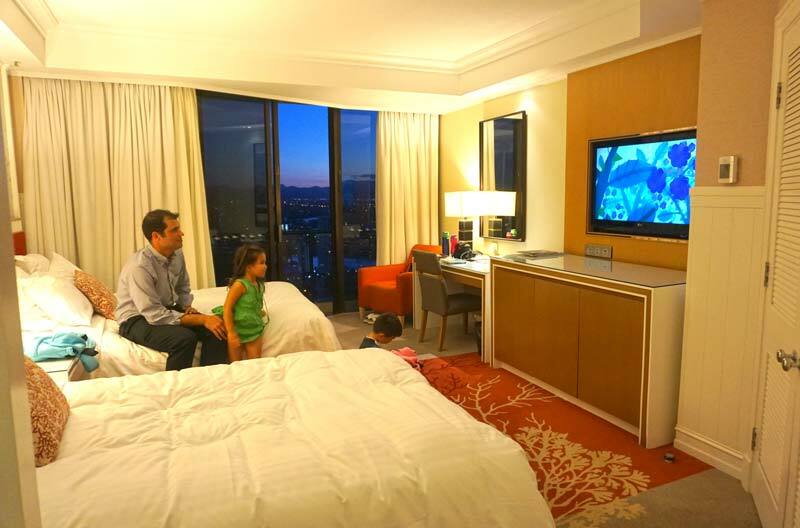 There is a 42 inch screen with satellite channels and a decent on-demand entertainment system where kids have a choice of several up to date pay per view movies. What we loved most and a testament to a five star resort is returning to the room in the evening to find perfectly lit rooms, fresh towels, beds magically turned down and chocolates placed on pillows. Any areas for improvement within the guest rooms are superficial, the coral coloured decor may not be to everyone’s taste and rooms are not as technologically innovative compared to newer resorts. A few modern accents that travellers maybe use to from luxurious resorts are absent but not overly missed, like a good in-room coffee from a Nespresso machine and in the era of cheap streaming media, free entertainment is almost as expected as free WIFI. 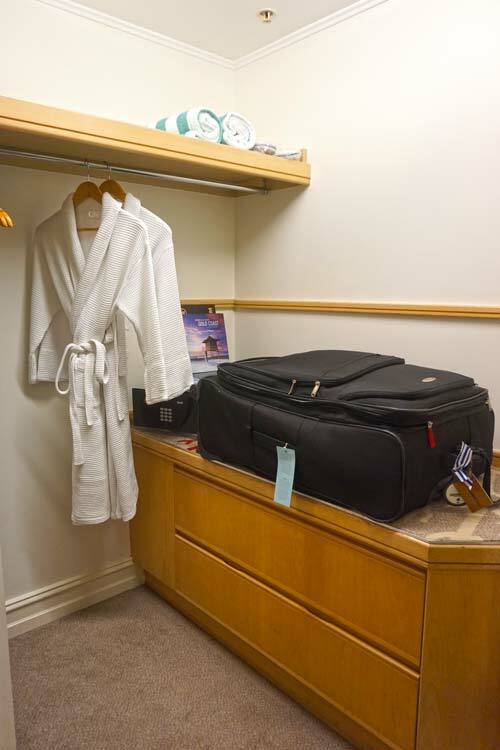 For larger families or parents wanting a little more privacy, connecting rooms are available on request. Parents, myself included, may be concerned over the safety of kids staying in balcony rooms, particularly with young children and toddlers that like to climb. 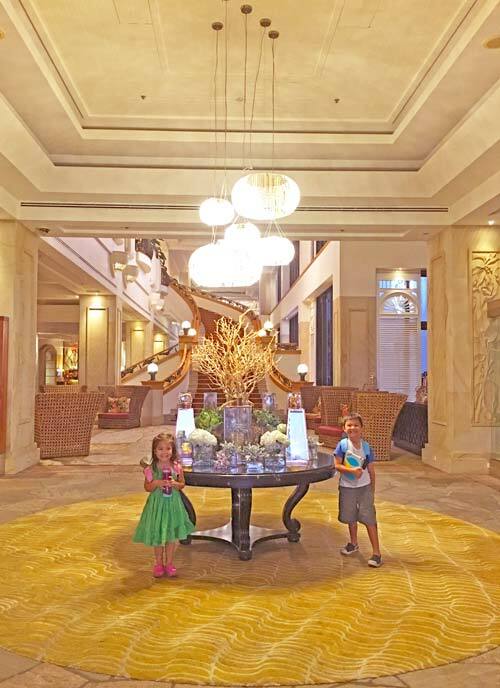 The Marriott Resort & Spa rooms balconies are glass framed with metal railing, tall enough that my 3 year old could not peer over the railing and reaching my 6 year old’s chin, with little chance the kids could accidentally lean and fall over. Exercise caution when out on the balconies, although the sliding doors did have a lock, the latch could be easily flicked up and doors opened. There was no key to permanently lock the door from the inside. Also, kids could accidentally lock parents outside by flicking the latch. On the balcony were two light metal chairs for sitting and admiring the views. It was quite possible for my kids to push the chairs towards the fairly narrow balcony. Our rule for the kids was that they were only allowed on the balcony with a parent and that chairs were only for sitting on. The doors remained closed at all times and the chained door latch positioned high on the balcony door was always fastened. To ease any worries, our kids were quite happy to ignore the balcony after the initial check-in excitement. Upgrade to a Club Lounge Room or Junior Suite for exclusive access to Elandra Club Retreat. Located on the 27th floor the lounge offers unobstructed ocean views and serves Continental breakfast daily from 6am to 10am with drinks and canapés served in the evenings from 5.30pm t0 7pm. Suite guests enjoy a private seating area, private balcony space, free WIFI and access to a library of books and magazines. 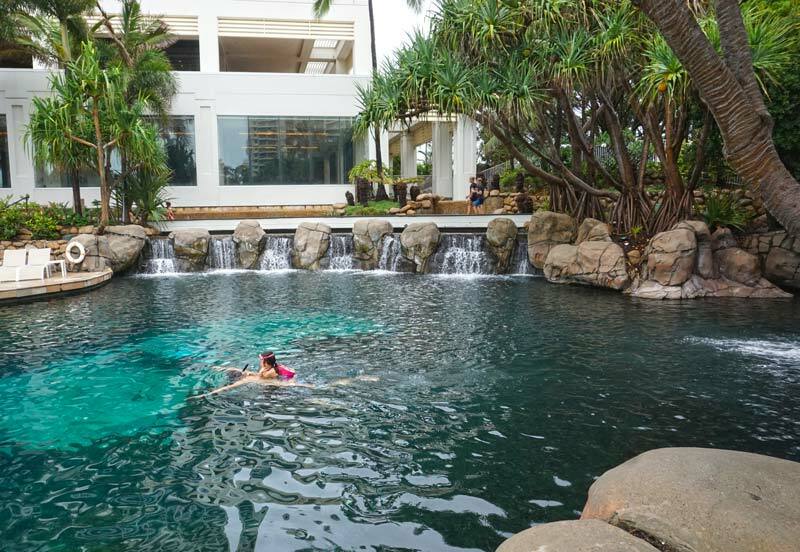 The pool at Surfers Paradise Marriott Resort and Spa is outstanding, starting at the Northern end with a heated spa grotto and underwater cave, kids can swim through a waterfall, float along a lazy river past outdoor jacuzzis before being received in a calm 1.2 metre deep pool, ideal for younger kids and babes in arms. 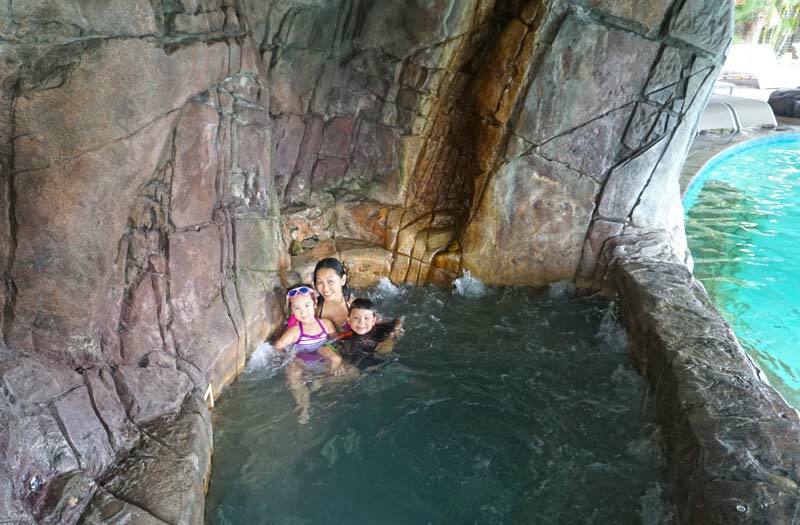 It’s advisable that young kids use a swim vest, back float or flotation device as the water flow to the lazy river near the cave can get quite strong for inexperience swimmers and the water is 1.4 meters deep. Even strong young swimmers may tire and need a pool noodle or float. 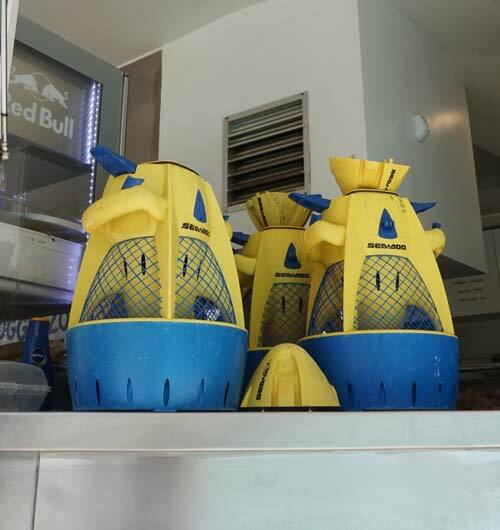 The Pool Bar kiosk serves up drinks and snacks such as burgers, calamari rings and a kids menu with the usual fair of hamburgers, nuggets and fish n chips all at $17 each. Kids can be propelled along Sea Scooters, available for hire at the kiosk along with pool noodles, snorkel, mask and fins. Masks and snorkel costs $15 per person for two hours. Rather than hiring gear for a daily fee, purchase inexpensive snorkel gear, pool noodle or floaties. There’s a Target at Southport Shopping Centre, 9 minutes by car, or Australia Fair Shopping Centre for Kmart, which is 5 minutes drive. Alternatively, bring your own from home. 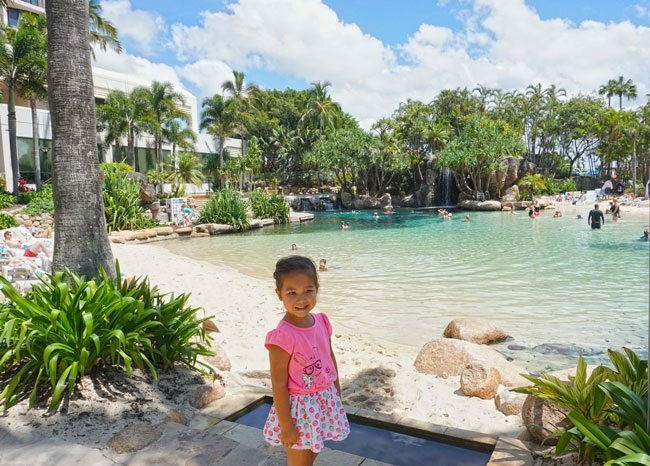 Kids can race up a series of steps to zip down a 11 metre undercover slide into a plunge pool and do it all over again – free! 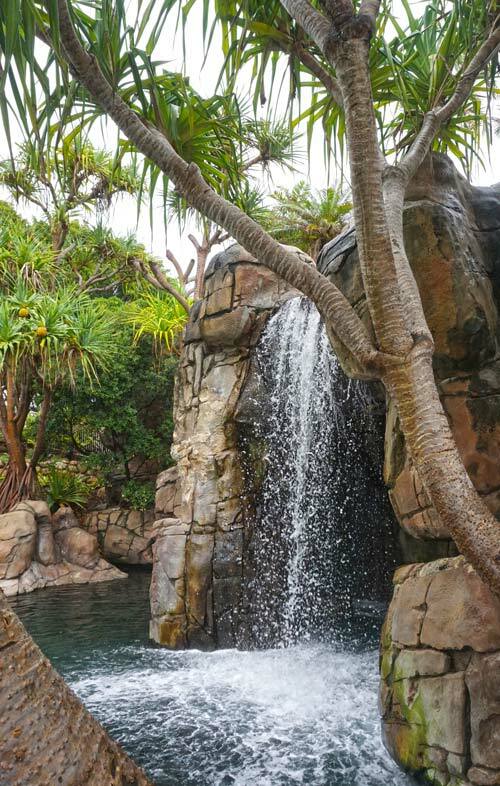 The slide has a height restriction of 120cm as the plunge pool is 1.2 metres deep. 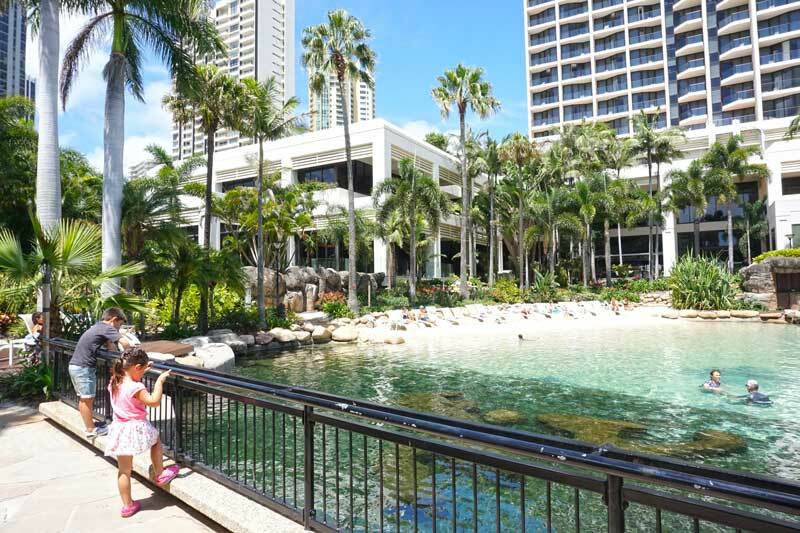 The Surfers Paradise Marriott Resort & Spa’s enormous lagoon, invites toddlers to build sandcastles on the beach, entices young kids to splash on its sandy shores or older kids to take a snorkel around in the saltwater and meet the resident tropical fish. 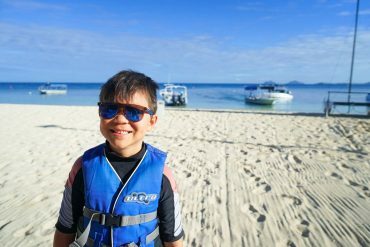 The lagoon is rather large, it gradually slopes down to 4.5 metres depth and has plenty of nooks to hide in making the fish quite elusive when snorkelling. Kids can spot them easier during feeding time which occurs held at 9.30am each day by the bridge. The resort’s lush tropical grounds has a large sheltered picnic area and BBQ facilities where families can fry up their own BBQ lunch by the pool. There are many sun lounges dotted around the pool and lagoon, whilst a few have umbrellas many don’t. Apart from the cave there aren’t many areas that are sheltered from the sun. 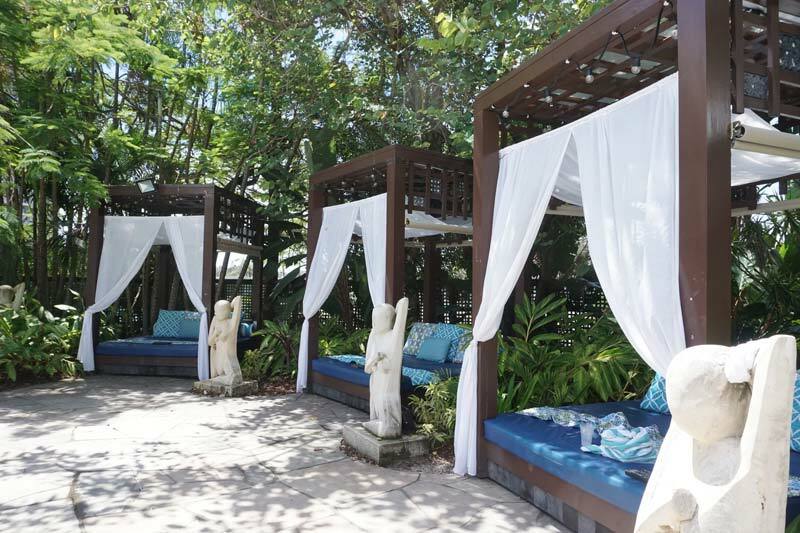 Cabanas with a sheltered awning and privacy curtains can be hired from the kiosk. These do not come cheap, half day cabana hire packages start from $90 which includes the cabana, two Pina Colada’s, two bottled waters and sun indicators. 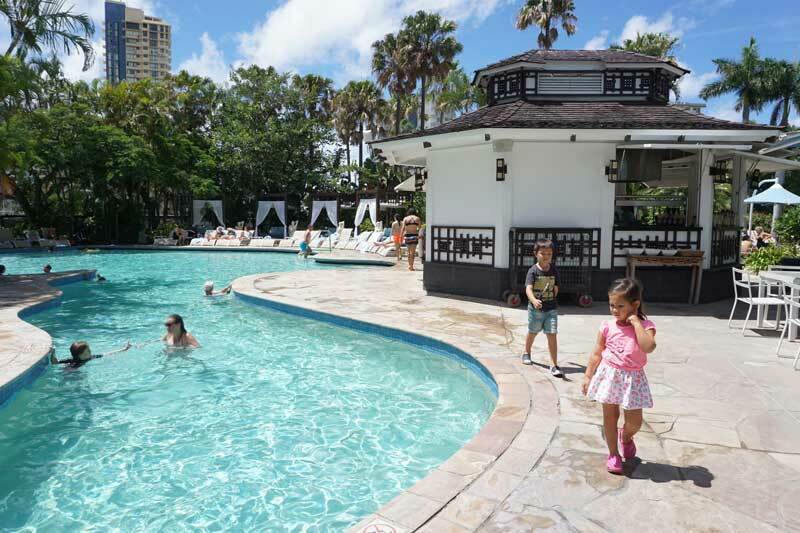 Surfers Paradise Resort and Spa’s Marriott Kids Club is one of the only supervised resort kids clubs on the Gold Coast which take kids out of the confines of a room for organised activities. Kids can go swimming, play tennis, make arts and crafts, watch movies, get their face painted and play sports. 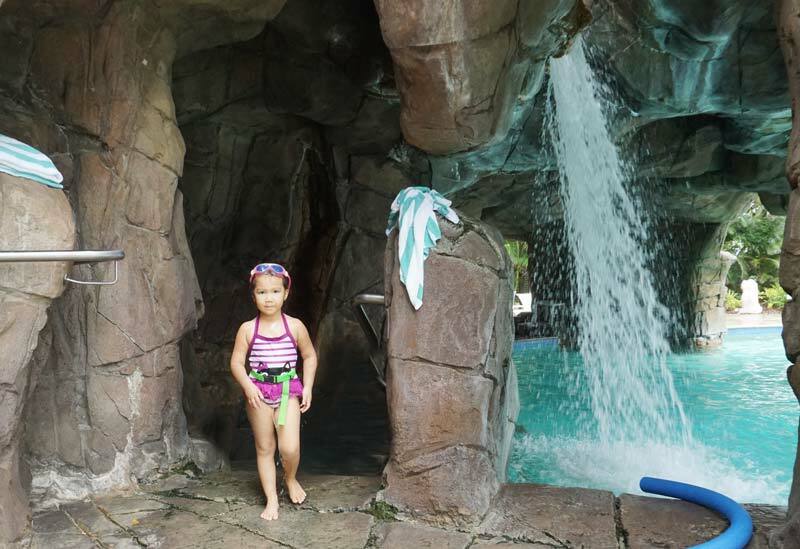 The 3.5 hour sessions provides parents an opportunity to explore the resort and make the most of kids free time. 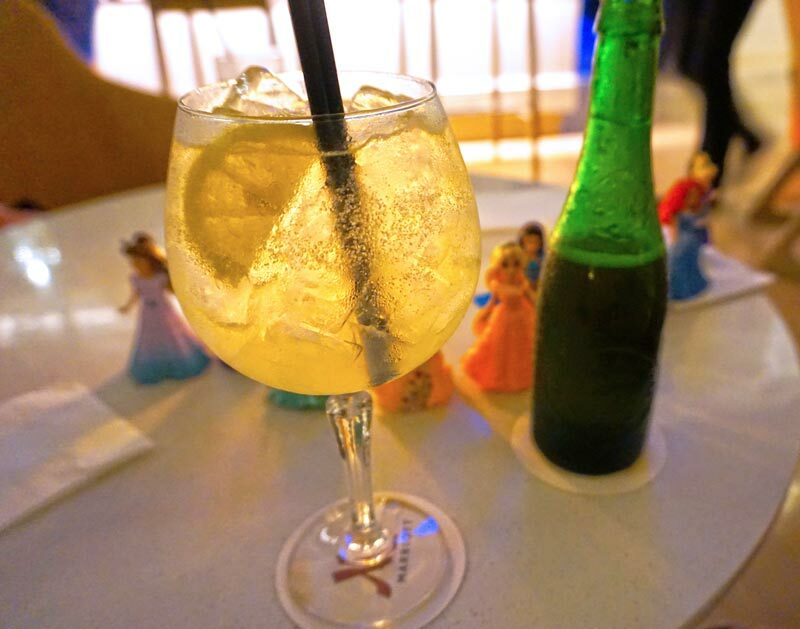 A well earned break to enjoy Ruby Spa, have a drink at the new Chapter and Verse Bar, lounge poolside or even venture outside the resort for a rare meal and conversation. Unfortunately the Marriott Kids Club only operates during school holidays, though there are plans to introduce it year round. Kids aged 3-14 are welcomed at three daily sessions. Each session is $50 for the first child and $45 for an additional child in the same family. 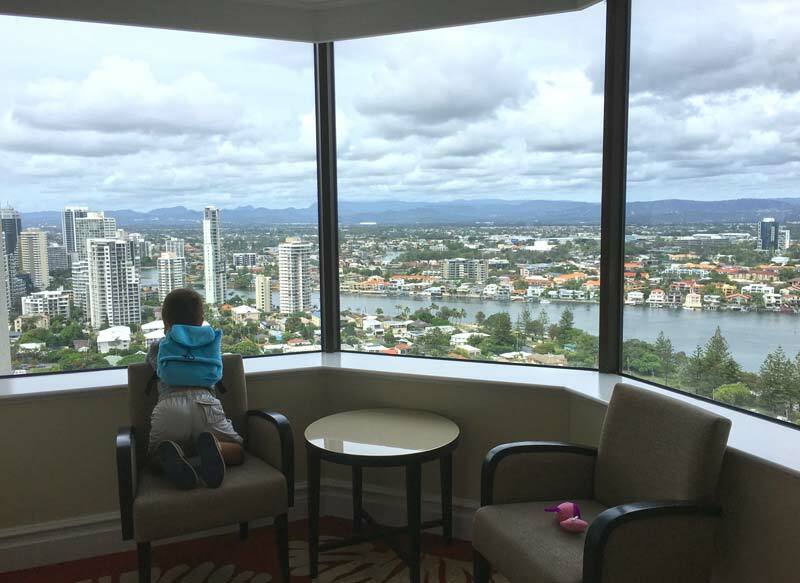 Parents who fancy a nice, slow dinner degustation or evening out in Surfers Paradise can arrange in-room babysitters for an additional fee. Rest easy knowing the service has been vetted by the resort. 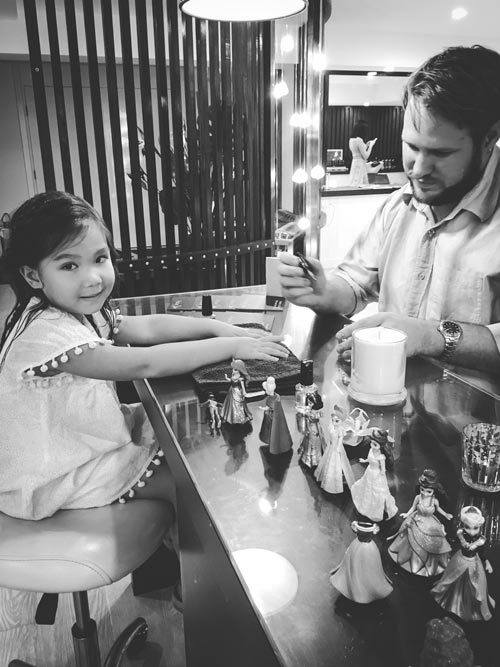 My 3 year old daughter and I had a mummy and me manicure session. My old and weathered hands were dipped in paraffin wax meant to remove impurities (which there were allot of) and soften. They worked hard to massage, buff, polish and moisturise my hands to resemble that of delicate daughters digits. As I sipped on champagne I could watch my daughter have her nails painted a sparkly pink. The 45 minute session ended with my daughter picking out a polish. 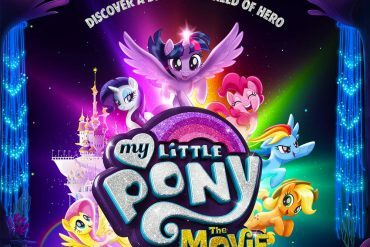 I went with her second choice a subtle shade of pink rather than a bright “Twilight Sparkle Purple”. 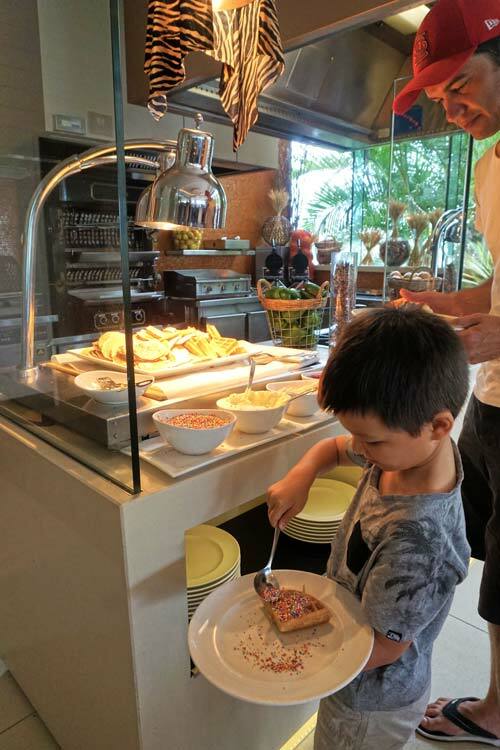 Our kids loved the breakfast buffet at Surfers Paradise Marriott Resort & Spa with lots of options to choose from. 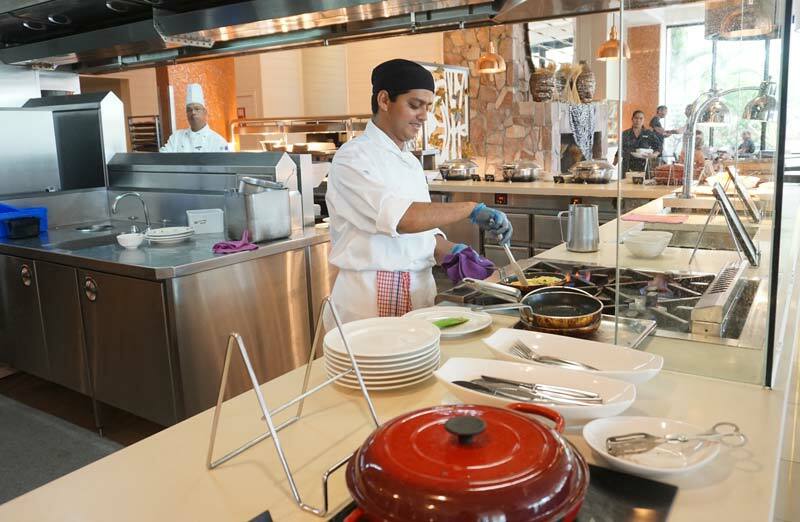 The buffet is located in the expansive Critique Restaurant with tall ceilings and sophisticated furnishings, including soft padded bench seating great for kids with plenty of space between tables. The light and bright dining room is flanked by tall glass windows overlooking the tropical gardens as well as the lagoon and waterfall. Keep an eye out for none to shy water dragons that stare through the windows at your breakfast bounty. We love a convenient breakfast buffet and there was a great selection, my son chose waffles with sweet condiments including chocolate sauce and sprinkles, my daughter a hard boiled egg, fresh tropical fruit, cereal and juice, my husband a full hot breakfast with eggs cooked to order, crispy bacon and buttery mushrooms and I opted for the Continental breakfast with salads and fresh leafy greens. 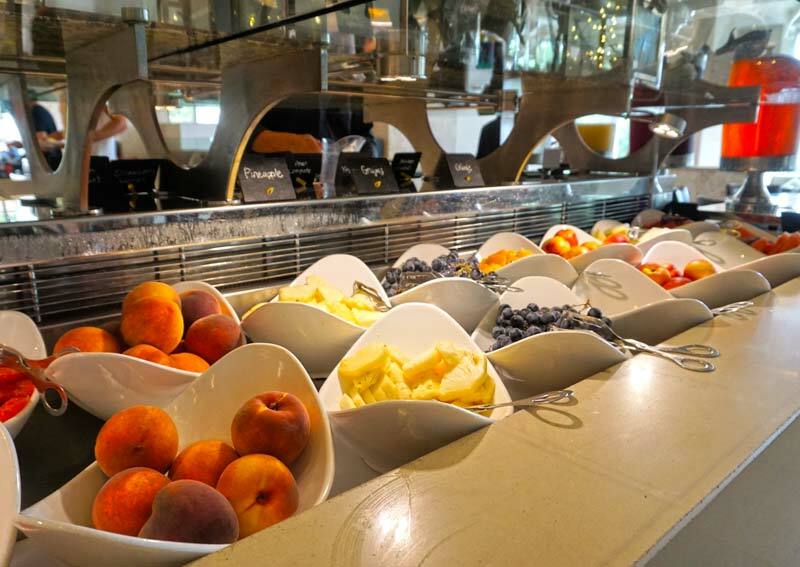 There’s plenty of healthy options too – fruit! The international choices included a Japanese Miso soup station with traditional pickles and tofu as condiments, the Chinese buns and dumplings could be selected fresh from large steamer baskets and there was an impressive assortment of fresh baked breads, rolls and pastries. 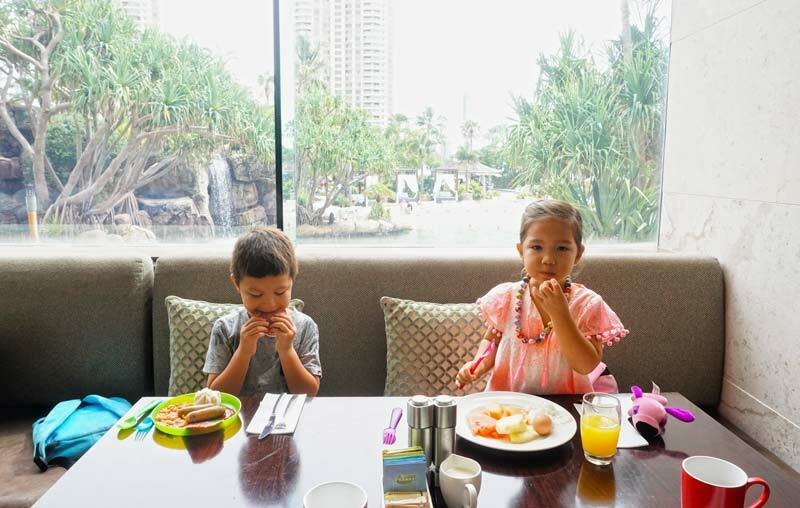 The breakfast buffet cost $39 per person and $42 on Sunday, kids aged 6-12 are half price and under 5 years dine free. We purchased a $100 per day, upgrade offered to us at check-in which included parking, breakfast for our family of four and on-demand movies. Where possible have breakfast at the resort and look for room packages which includes breakfast. 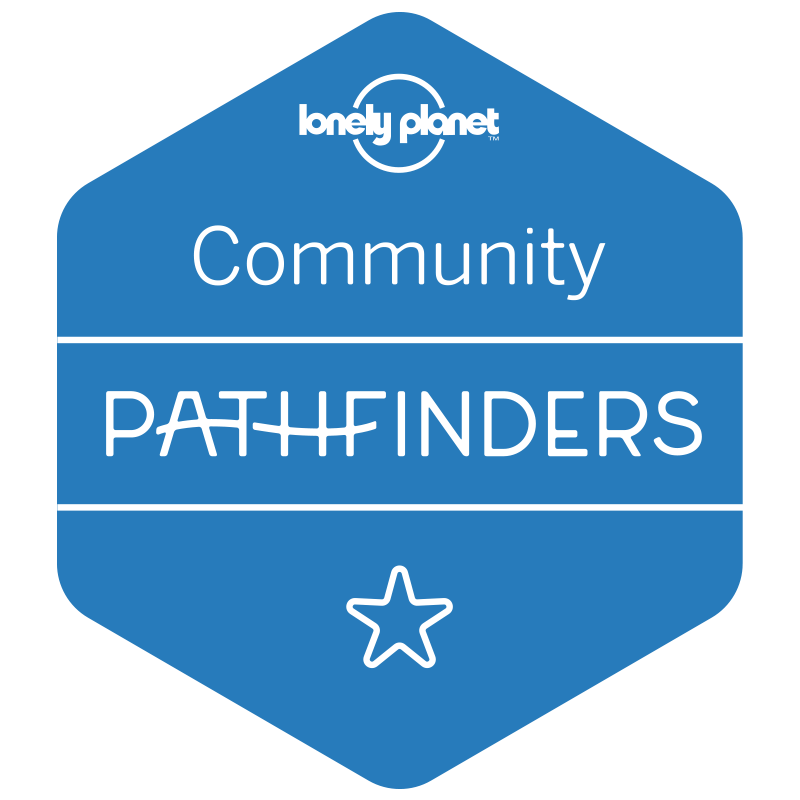 Families can start the day on a good note eliminating stress and wasting time travelling to and searching for a place that is open. 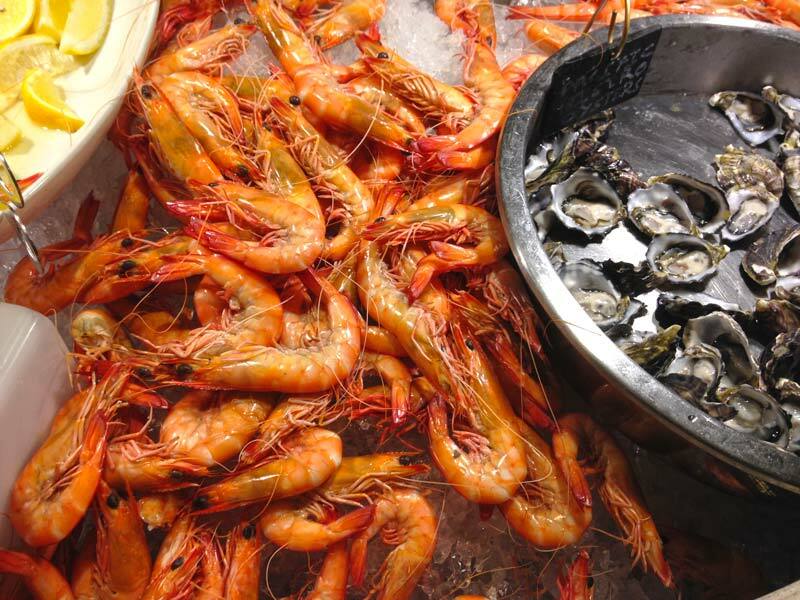 Unmissable is the Seafood Buffet, arguably the best Seafood Buffet on the Gold Coast, with an exquisite selection of fresh seafood including spanner crab, oysters, Moreton Bay bugs, swimmer crab and loads of trawler fresh prawns. There’s also sushi and sashimi, fresh salads and a delicious meats and cheese selection. 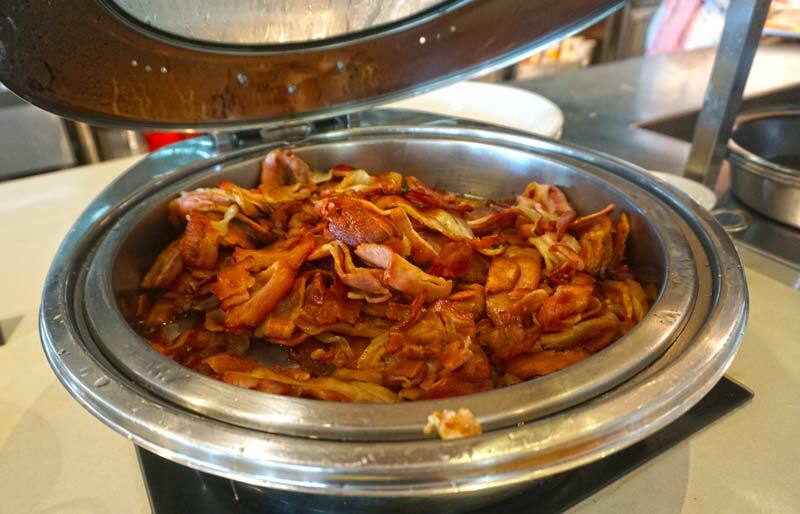 If you can steer yourself away from the Seafood there is also plenty of hot menu options including a hot roast carvery with all the trimmings, meat, pasta and cooked fish selection. There is also a wonderful desert station, where you can scoop your own gourmet ice cream and top it off with the wide selection of sweet condiments from strawberry topping to smarties and gummy bears. Critique Restaurant seafood buffet is amazing! 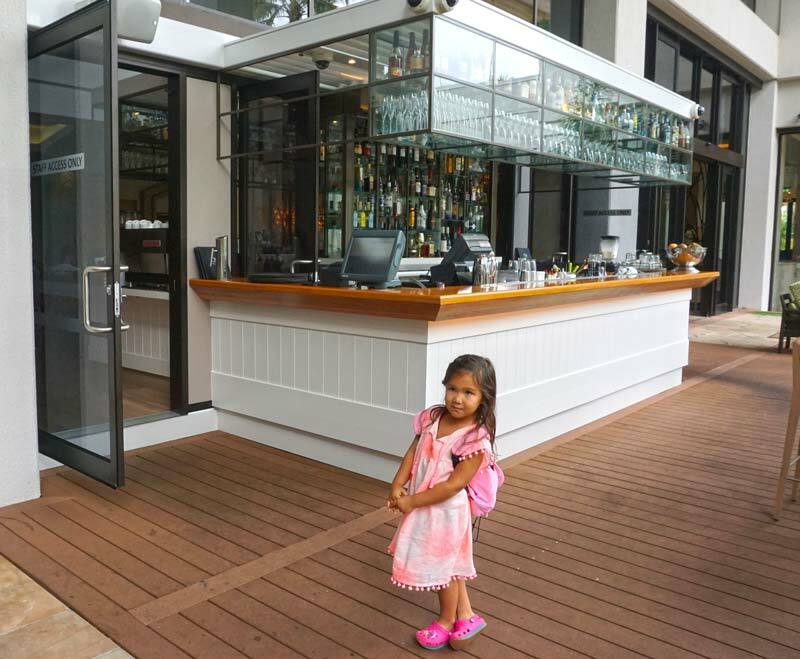 Kids aged 6-12 years old are half price and under 5 years dine free. Although, even for half price, a 6 year does not get value for money. Open from 6pm to 9.30pm on Monday to Thursday and 6pm to 10pm Friday to Sunday. Bookings are essential and reserve the early seating to get through all the stations. Chapter & Verse is the new addition to the resort and cleverly positioned under the grand staircase serving guests on the roomy alfresco deck overlooking the lagoon and guests making themselves comfortable on lounges and cocktail tables in the lobby area. A rare family portrait with milkshakes! Friendly bar staff in suspenders, bow tie and the carefully groomed beards deliver light snacks such as wedges and salt n pepper calamari as well as making delicious drinks, like the Madmen inspired champagne cocktail which packs a punch. Kids are not left out with healthy smoothies, soft drinks and strawberry milkshakes available. If you’re lucky staff might even offer some copper buckets of fresh popcorn usually reserved for staff. 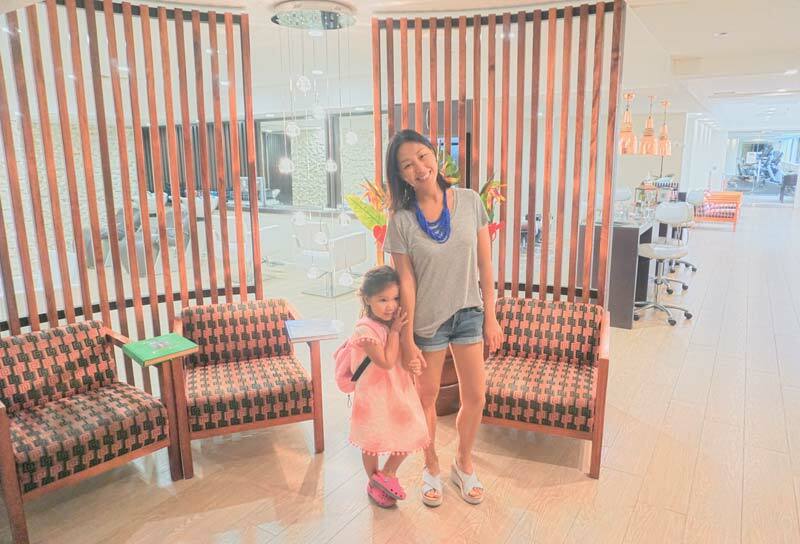 Families can drive up to the undercover lobby entrance to check-in and kids can wait on oversized rattan chairs. Once checked in, families can opt for a $15 a day fee to self park in the parking garage underneath. A ticket is issued by guest services to gain entry to the car park. The fee is added to the account and can be settled when checking out. The $15 daily fee allows unlimited entry in and out of the car park. There is also casual parking available at $2 an hour, $5 between 3-5 hours and $15 over 5 hours. Valet parking is available for $25 a day. Across the road from Surfers Paradise Main Beach, swap the lagoon for the beach and back again in minutes. 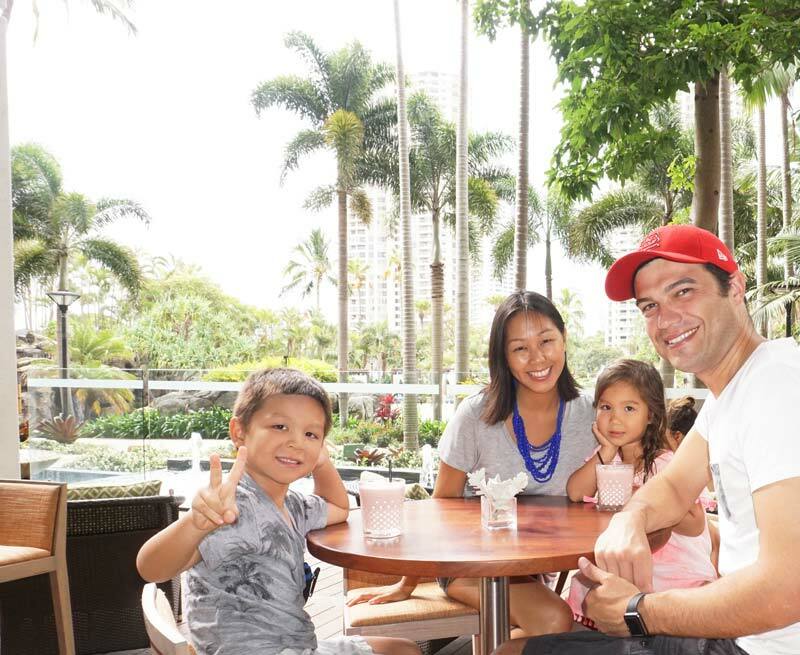 Families can take a leisurely morning stroll along the beach to the main commercial hub of Cavill Avenue for shops, which is a solid 15-20 minute walk with kids, slower if intending to stop and play with young kids. 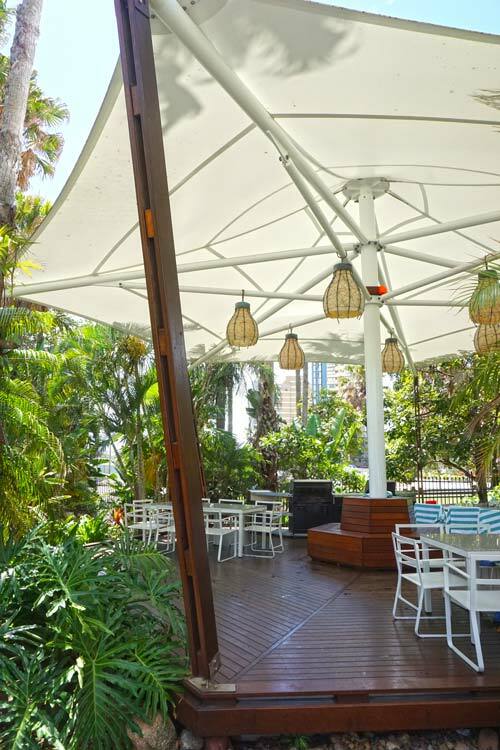 Cavill Avenue offers a variety of food, shopping and entertainment options. The return journey can be taken on the G Link tram, which is two stops away or a 10 minute tram ride. 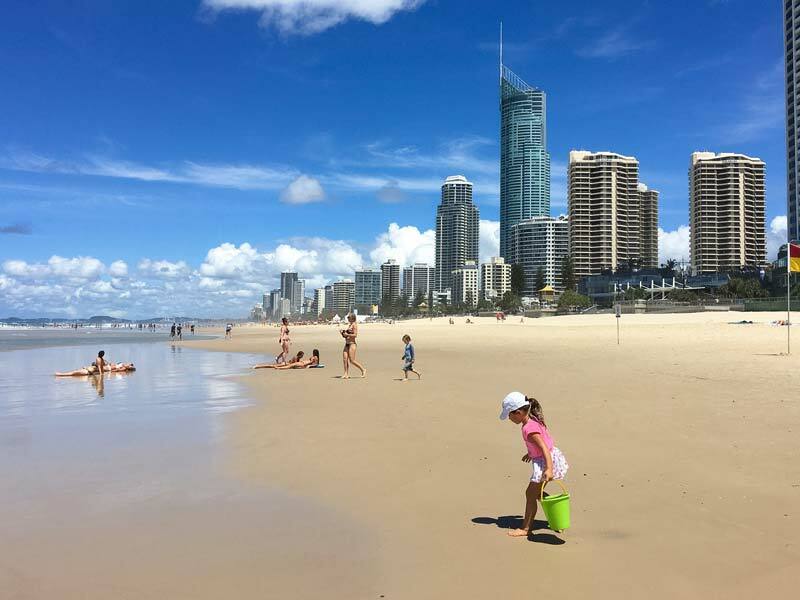 The bus stations on Ferny Avenue and the G Link tram service is moments away, which take families around Surfers Paradise and to Gold Coast’s theme parks and attractions. More information on the G here. 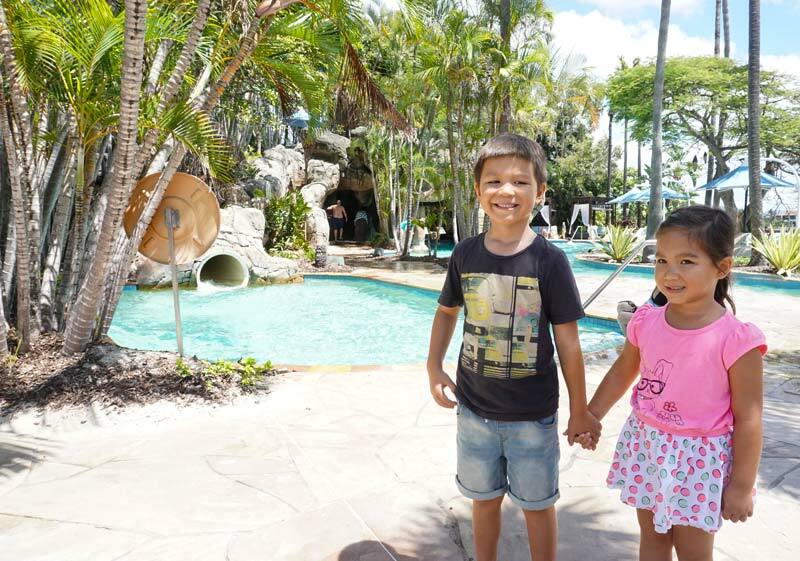 The resort is ideal for families with their own car, making anything around Surfers Paradise and the Gold Coast easily accessible including the theme parks. Sea World is 4.7km away or 7 minute drive, Warner Bros Movie World is 17.4km away or 24 minute drive, Dreamworld is 24.2km away or 28 minutes drive. 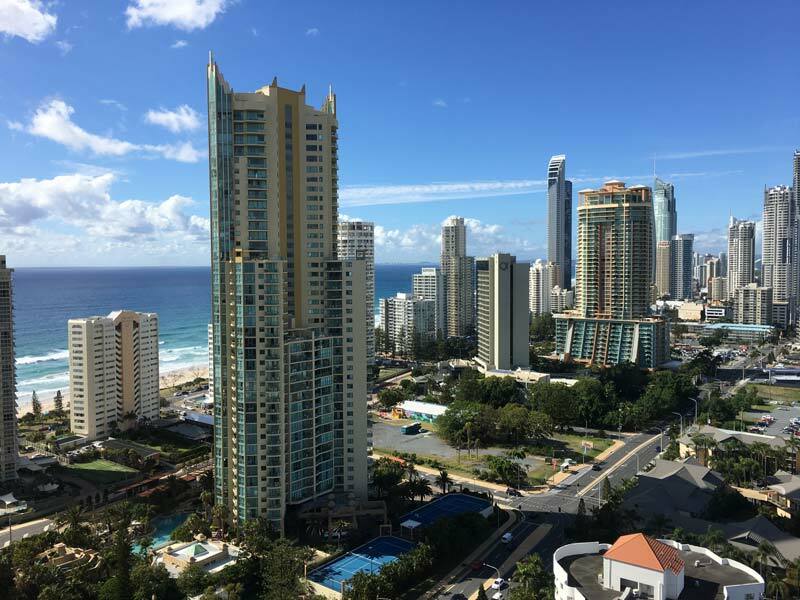 Guests have complained that the Surfers Paradise Marriott Resort and Spa is not central enough to Surfers Paradise. Positioned on the North end of Main Beach, the main hub of Cavill Avenue is a relatively long walk for little legs, even if opting for the flat footpath along the Esplanade. 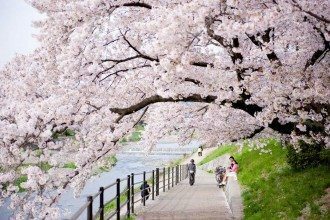 However the walk is not impossible. The Gold Coast light rail ‘G Link’ tram ticket prices can be uneconomical for a quick ride. For our family two stops one way to Cavill Avenue would cost $3.35 on a Go Card ($4.80 single ticket) one way per adult, and $1.67 on the Go card ($2.40 on a paper ticket) for our son over 5 years with our 3 year old being free. At the cheapest Go Card rate it would have cost $8.37 for a 2 stop ride for our family ($16.74 return) and more for a paper ticket. 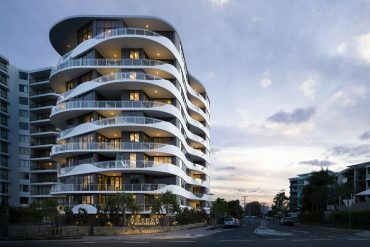 For families with their own car, it is a quicker and less costly option to pop down to Cavill Avenue, with free parking for 2 hours at Woolworths. 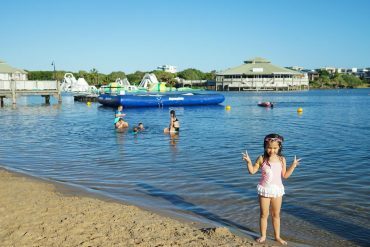 What we loved about the Surfers Paradise Marriott Resort and Spa is the nice mix of demographics, although family friendly the resort does not just cater to masses of kids and their parents. On a typical weekend, you’ll find young happy couples sipping cocktails and worshipping the sun, look away as they are a vision of your former selves, kid and care free. Older couples are taking a quick dip in the lagoon where less children are, before retiring under a umbrella with a good book. 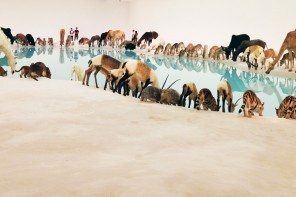 There are groups of international guests completely covered up with selfie sticks in hand and in the lobby are well dressed groups of pensioners, ladies in pearls and pastel ensembles and men in khaki pant suits arriving early for Sunday Brunch. During school holidays, families make up larger numbers. When the bellman remember your children’s name, extra towels are brought up lickety-split and little surprises are provided at turndown, you know you’re onto a winner. Rooms and facilities were clean and comfortable, check-in was courteous and quick and staff were switched on, kind and helpful. 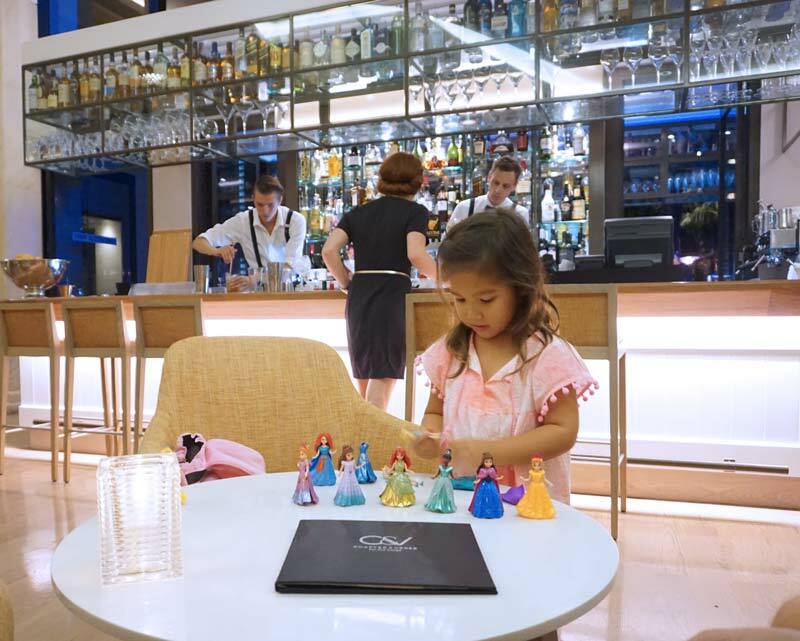 We love the relaxed Gold Coast feel where little feet in rubber crocs are welcomed into the majestic light-filled open lobby of sweeping staircases, contemporary crystal chandeliers and oversized rattan chairs, as much as guests in stilettos and Italian leather shoes. 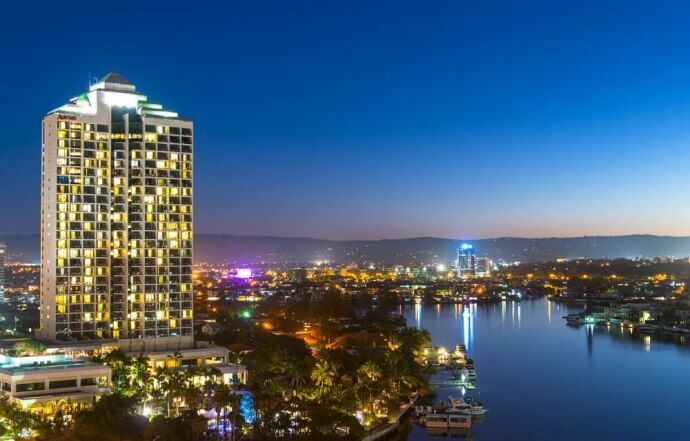 For further information see marriott.com.au or find the best rates for Surfers Paradise Marriot Resort and Spa here. 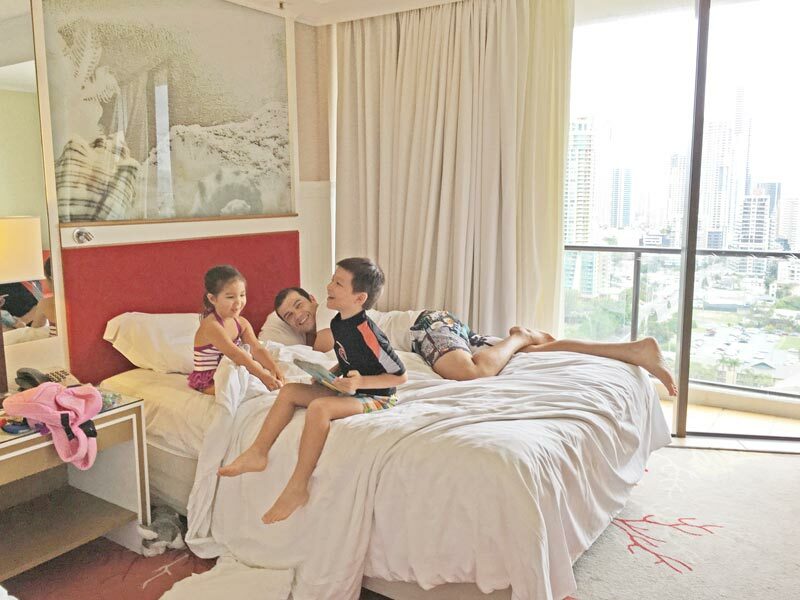 Ocean Rooms from $359 per night for a family of four. 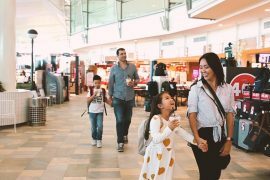 Virgin Australia, Jet Star, Air Asia X, Qantas, Scoot and Air New Zealand fly directly into Gold Coast International Airport in Coolangatta (OOL). 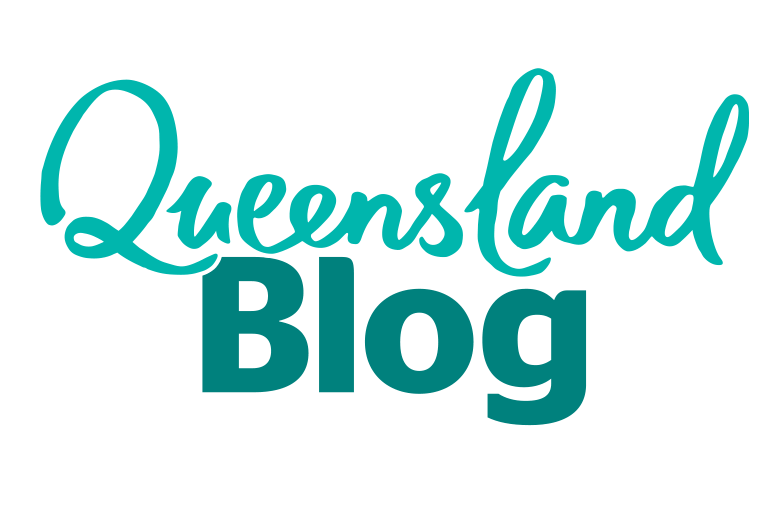 Most major airlines fly directly to Brisbane International Airport (BNE). 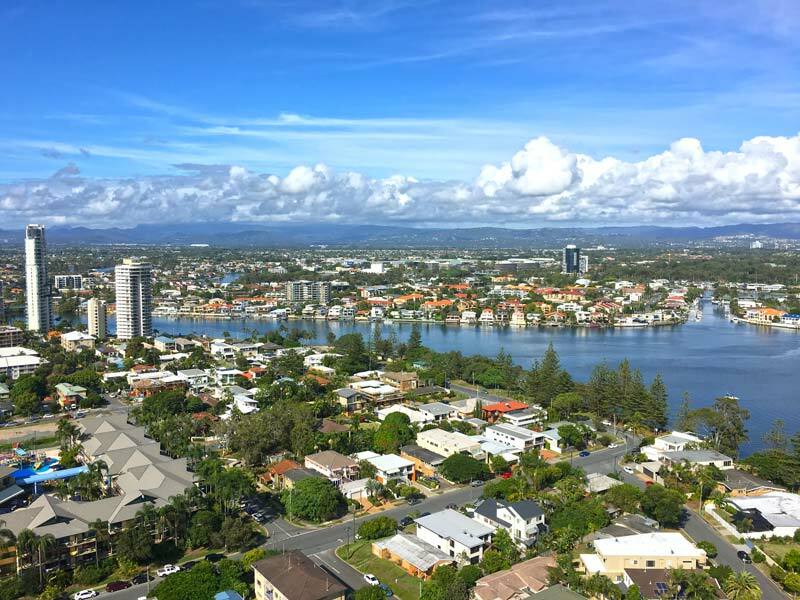 From Gold Coast International Airport in Coolangatta to Surfers Paradise Marriott Resort and Spa is a 45 minutes drive North by car. Car rental is available at the airport. An approximate taxi fare ranges between $70 – 80 AUD. Less in an Uber (aprox $40-$60 AUD). From Brisbane International Airport to to Surfers Paradise Marriott Resort and Spa is a 1.5 hours drive depending on traffic by car. Car rental is available at the airport. An aproximate taxi ranges between $90-$110 AUD. Less in an Uber (aprox $55-$75 AUD). 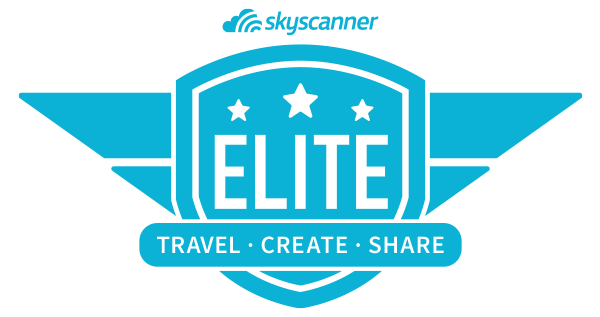 There are shuttle transfers from both airports see shuttle services listed at Gold Coast Airport and Brisbane Airport. 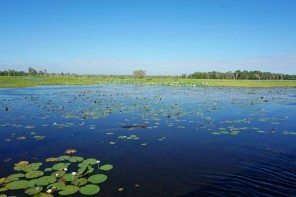 We were guests of Visit Gold Coast and were under no obligation to write about the resort, I simply wanted to share. 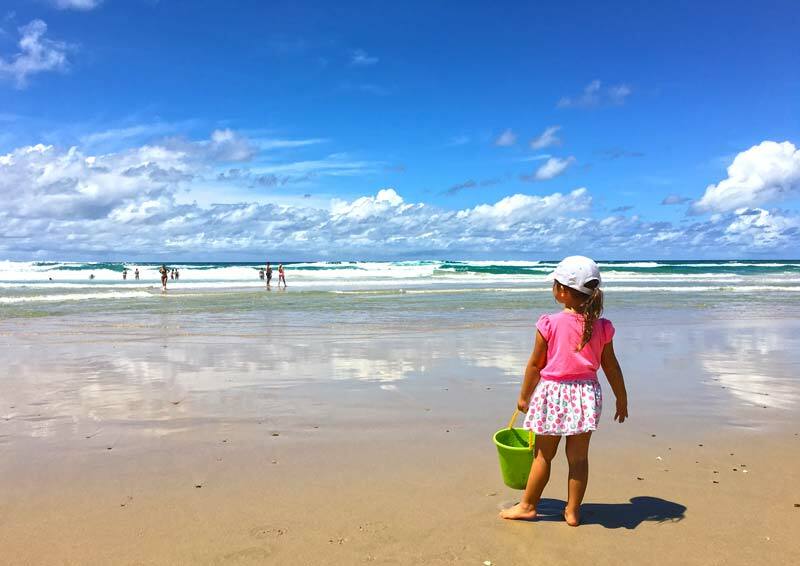 Read about the Top 7 Kids Clubs On the Gold Coast here.